Reader Gina said she was driving by the former Subway location at the corner of Mission & State Streets, next to by 7-Eleven, and noticed that work is going on and that for Ike’s Love & Sandwiches has been posted. This would be the second South Coast location for the eatery chain which opened at 6530 Seville Road in Isla Vista in April 2016. I met founder Ike Shehadeh Mission, who was in town for the Isla Vista grand opening, and was told that his restaurant is the kind of place where if you’re vegan, or your significant other eats meat, or they’re gluten free, everybody can go to the same spot together and not feel like they’ve compromised. Historically the Ménage à trois and Matt Cain sandwiches are really big sellers. I tried the Ménage à trois sandwich, which was invented by staff members, and it is now officially on my top-ten list of favorite sandwiches across the South Coast. It gets its name because this chicken sandwich has three sauces (honey, honey mustard, and bbq) and three cheeses. Visit loveandsandwiches.com. 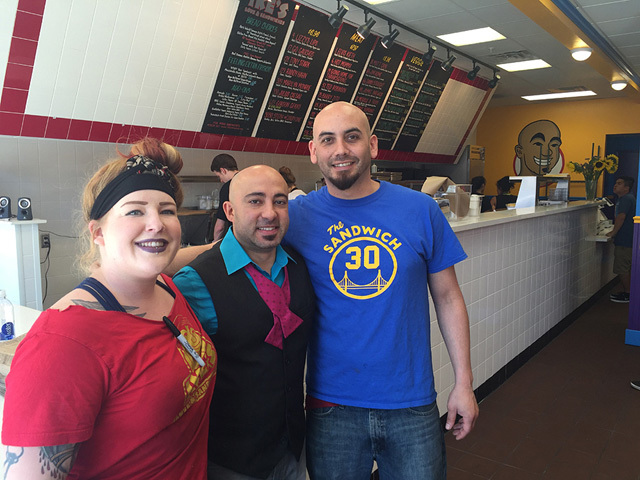 (L-R) Jessie Trimm (employee/owner), Ike Shehadeh Mission (owner), and Alex Bermudez Jr. (employee/owner) at Ike’s in Isla Vista. It will be nice not having to trek out to IV for an Ike’s sandwich, this place is awesome. Love Ike’s! They make a great sandwich and their Dutch Crunch bread is delightful. Happy to see that they are opening downtown. I look forward to giving this new location my business. Ike’s is awesome! Looking forward to this one opening up. Now THIS looks like a great sandwich place. Any idea when it will open? Ike’s will KILL IT on State!!! The Isla Vista location is closing 4/13 and the state street location will be opening about a week after. Love the onion rings!! Love the Dutch Crunch! My vegan was happy with her sandwich!